Day 6 & Day 7 – A Card a Day in May Giveaways & Winners PLUS last week’s Pink Candy Winner! Oops! I missed Day 6 so I will put it with Day 7. 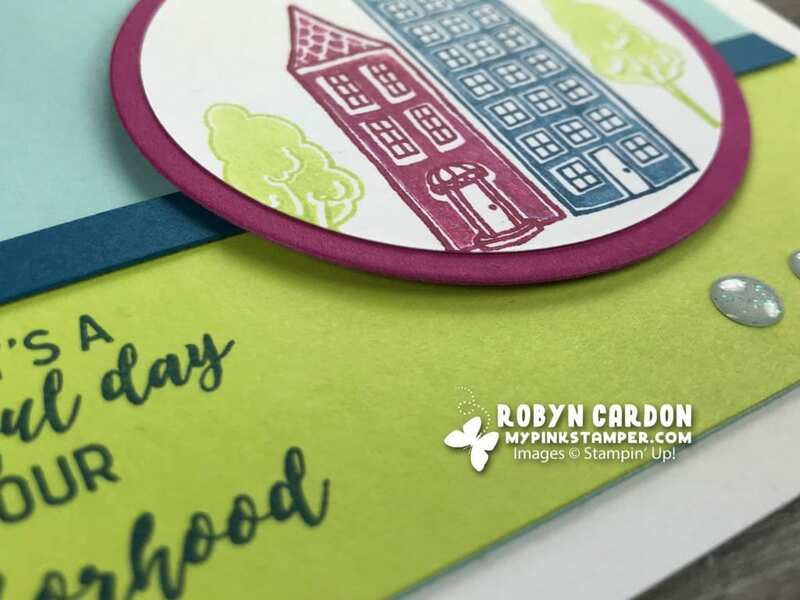 Today I am about to have my HUGE day at Stampin’ Up! HQ where they will celebrate my Million Dollar Achievement. Honestly, I think they already have done SOOOOO much for me but the party continues and the goodies! I am going to try to pop in live at some point tomorrow. Maybe when I am stamping with the CEO or the Co-founder. That would be super fun! 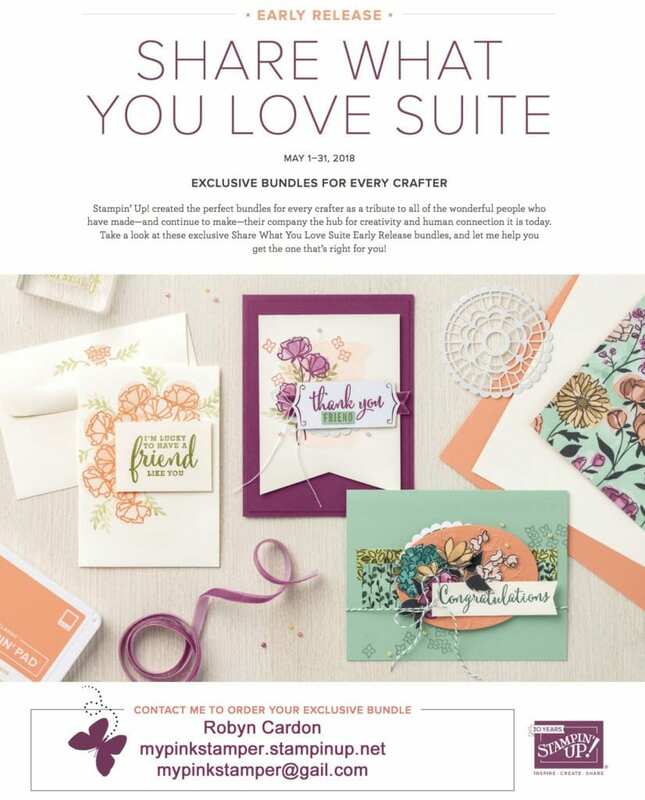 Did you know today is the LAST DAY to join in on my Online Class Promotion for the Share What You Love Bundles??!! Here is all the info just in case you missed it…..
To read all about #acardadayinmay2018 click HERE! *You do not have to participate to enter. Feel free to share this campaign with me all over the web! Just use #acardadayinmay2018 when you post on Facebook and Instagram. No need to link in the comments. I will find you. I hope you all have a GREAT day!!!! I will see you soon! Love how beautiful and do -able your cards look! Love your color choices for these cards! The first one reminds me of Scandanavian patterns! Love the day 6 card, cute & simple. Enjoy your time st SU HQ & thanks for sharing. You are amazing at everything you do! 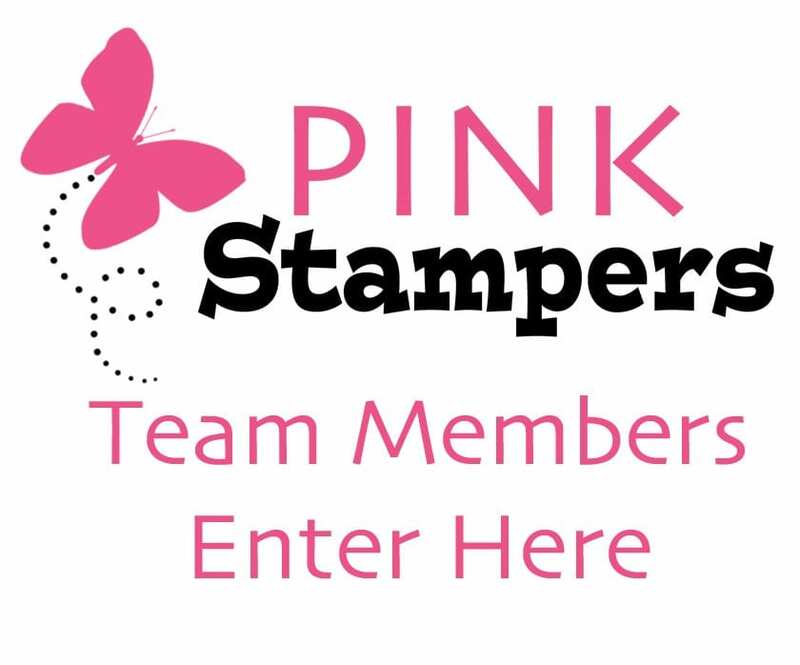 I can only imagine how excited you must be to get to spend time and be pampered by Stampin’ Up at their headquarters! Enjoy yourself and have fun! 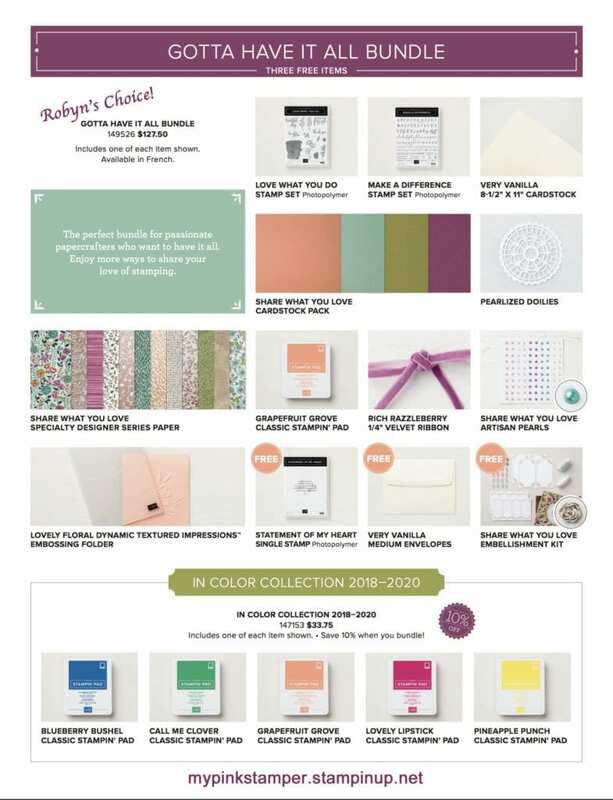 I’m so excited to see what stamp set or stamps and products will be part of your designed set!! I’m so excited for you to have this opportunity! Thank you for all of your wonderful cards and ideas. You are truly gifted and talented! Have fun at HQ! Congrats! Have fun at the home office. Can’t wait to see what your stamp set is! That’s so cool that SU is still honoring your accomplishments! You so deserve the royal treatment! You,really domgo above and beyond for Your Customers! Auto correct! You really do go above and beyond for your customers! I love your cute, easy cards! Congrats and enjoy your Million Dollar celebration! Cute cards. Love the little bird. Woot woot! 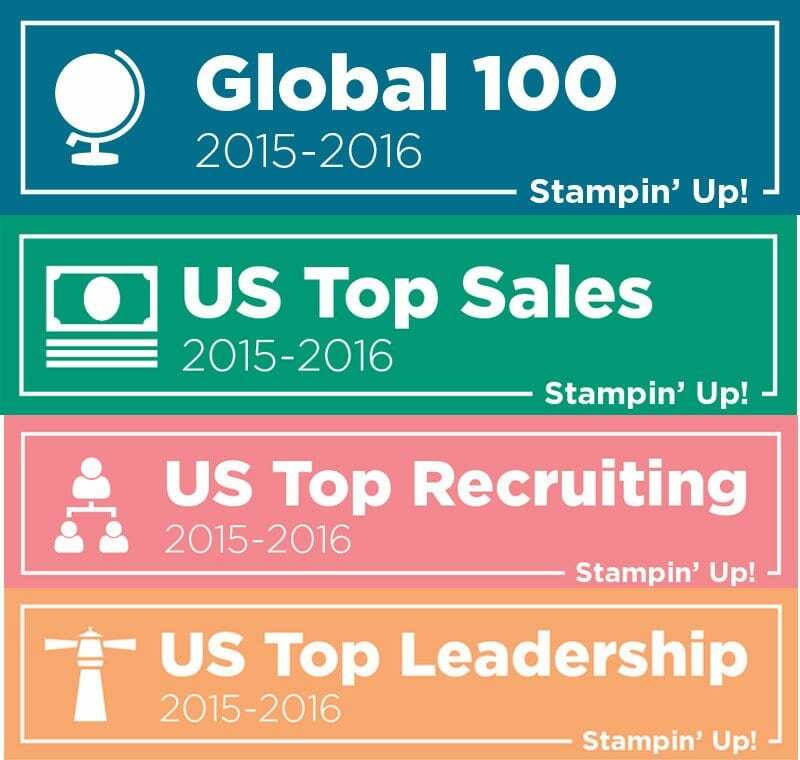 Congratulations on your milestone and I know you’ll have a wonderful time at Stampin’ Up HQ as you celebrate your achievement! OMG! I’m a Pink Candy winner!! Hugs & Thanks Robyn!! Congratulations to all the next potential winners out there. Wishing you an amazing time Robyn at SU HQ being treated as their VIP! I love these bright card colors. Congratulations on your wonderful achievement. Have fun! Robin, have a fantastic trip at Headquarters! How exciting! Congratulations!!! Hope you have fun!! You totally deserve it! 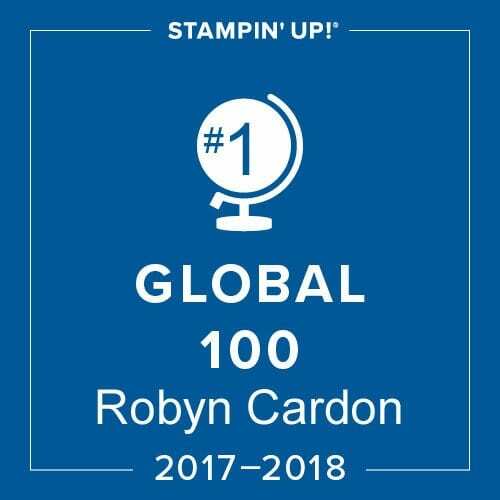 Congratulations Robyn in your achievement! I love all of your awesome card ideas and videos. Thanks for the chance to win! Congrats Robyn!! Have fun at SU, you earned it!! Have a fantastic day! The cards are adorable. Congrats! I know you are having so much fun. Congratulations, Enjoy yourself, you deserve it!!! Cute cards! Love the stamp sets! 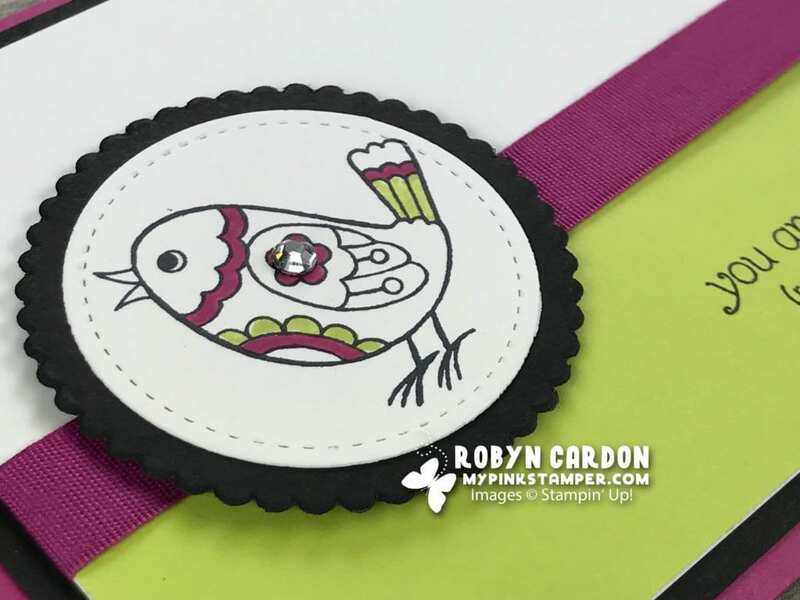 Robyn, Have a fantastic day at Stampin’ UP! HQ. Can’t wait to see pictures. 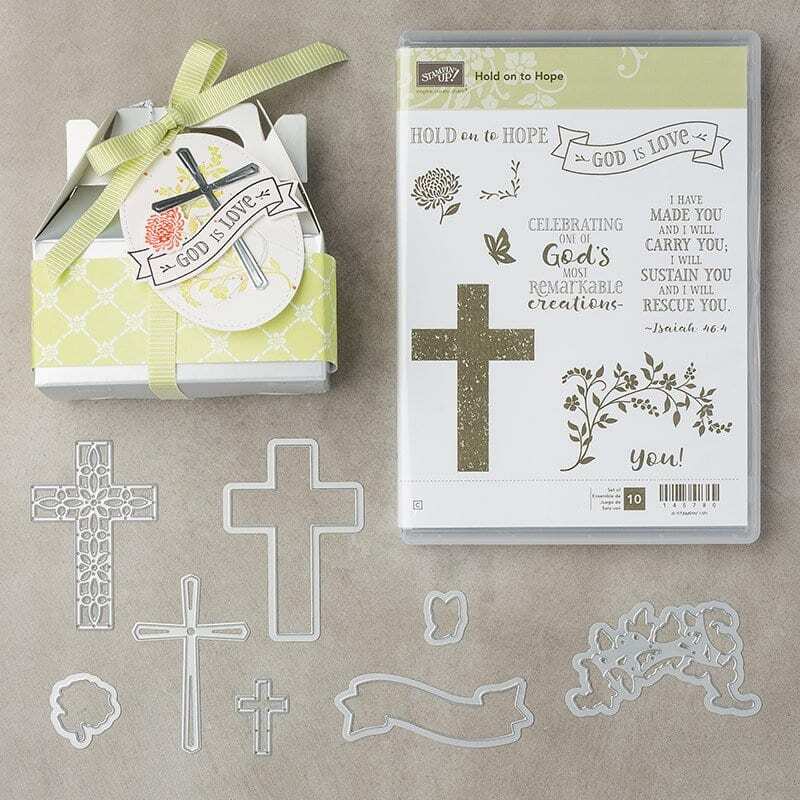 I love the Hold onto Hope stamp set – it is beautiful. Robyn I hope you enjoy every minute of your time at SU headquarters. I love being inspired by you in so many ways. I love doing the card a day in May and figuring out who I am going to do a card for that day. Enjoy and prayers for safe travels for you and your husband. Cute card. Have fun at HQ. Oh What a fun time…..ENJOY!!!! 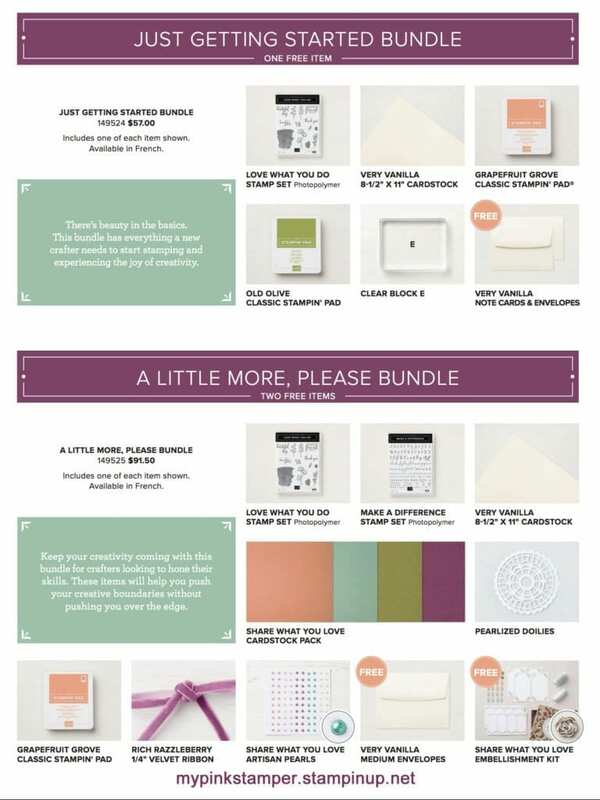 I have a neighbor going thru a very big medical problem since this past November, the Hld in yo hope bundle would really cheer her up and give her “hope “! Lovin this challenge. Give me encouragement to get in my craft room and make cards. Love all the cards that have been posted so far. Robyn, have a fun day today! You deserve it! How exciting, and so well deserved!! I am participating in your card a day in May challenge and i love it! Thanks for the inspiration. Love your Day 6 & 7 cards! Have fun with your SU celebration! We want to hear all about it! Have a great week Robyn! Have fun celebrating your million dollar milestone! What a special day for you, enjoy the journey. Feathery Friends is soooo adorable. Enjoy your visit at HQ! Thanks for the opportunity to win these cute stamps! Your visit at HQ will be amazing! Congrats!! Enjoy all the love from Stamping Up. You have worked hard for the rewards. Congrats again! You are always an inspiration. Can’t wait to see what you do next. Have an awesome day! 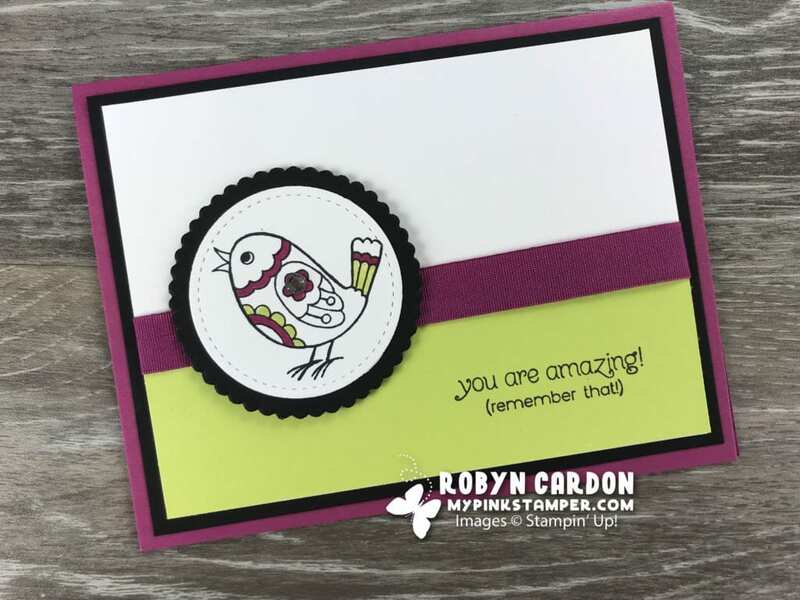 Robyn I hope you enjoy you’re Special Day at Stampin’ Up. You are so insprining to all. Congratulations. Enjoy your special million dollar achievement days, you are awesome and deserve it! 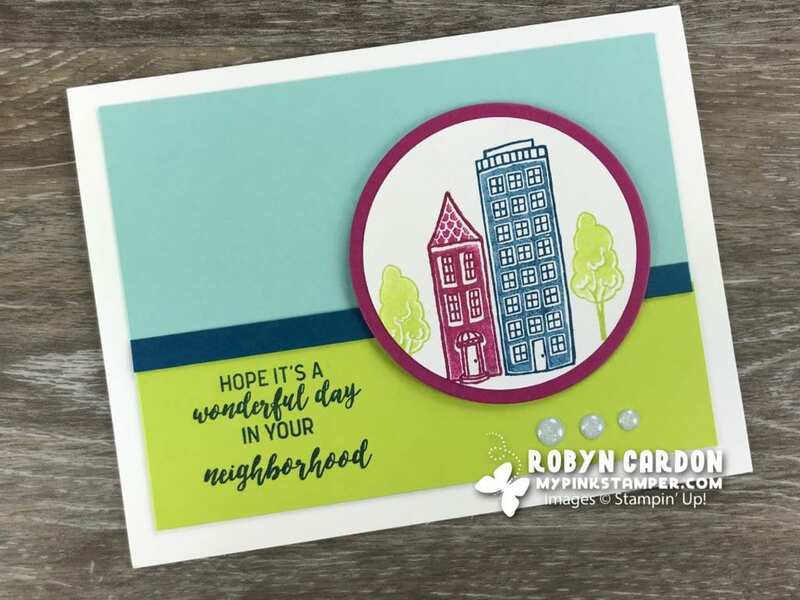 I love the In the City stamp set, and never thought about stamping the outline and the building inside in the same color, I always use two colors, but love the way they look on your card! Will have to try that… Thanks for the idea! Beautiful cards!!! Hope you are enjoying your time at SU! receiving wonderful prizes and memories!! Thanks for the chance to win! Love the cards! Have fun on your special day!! Love the cards. 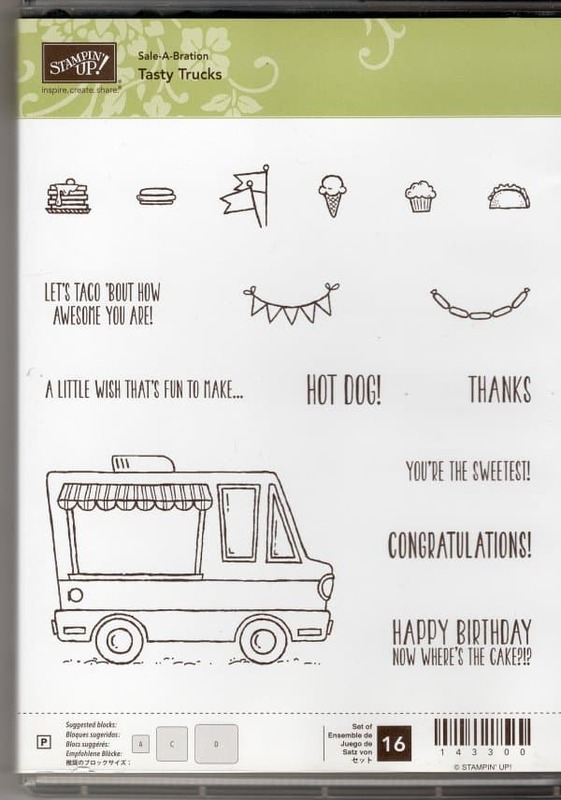 Have fun on your special days at Stampin Up! Congratulations again on the Million achievement. Your cards are so cute and I love the color combos. Thanks for sharing the cards. So exciting! Can’t wait to hear all about your big day. Congratulations! Love the color combinations in your cards. Enjoy your special time at headquarters, you deserve it! Congratulations – enjoy your special day!!! Enjoy you special day! Thanks for the great giveaway opportunities. Love your cards! Congratulations, and have a wonderful day! I absolutely love your cards and will be CASEing. Thank you! Congrats on your awesome accomplishment!! 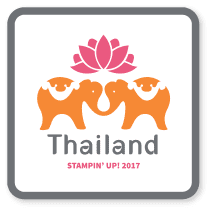 Hope you have an amazing time at the Stampin Up HQ. Thanks for sharing. Have a great day! You deserve it! Enjoy your special day at SU headquarters. I know you can’t tell us what your special stamp set will be but can you tell us a time frame of what catalog we can look for it? Have a great time at Stampin Up HQ!! Congratulations again on your accomplishments! Cute cards and awesome giveaways! 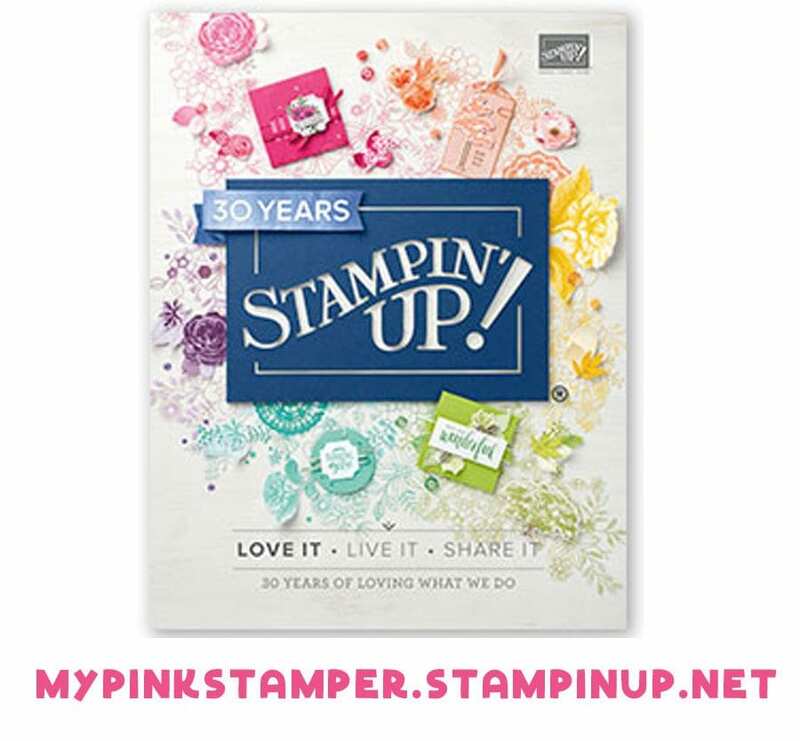 Have a wonderful time at Stampin Up HQ…. Can not to hear all about it !! 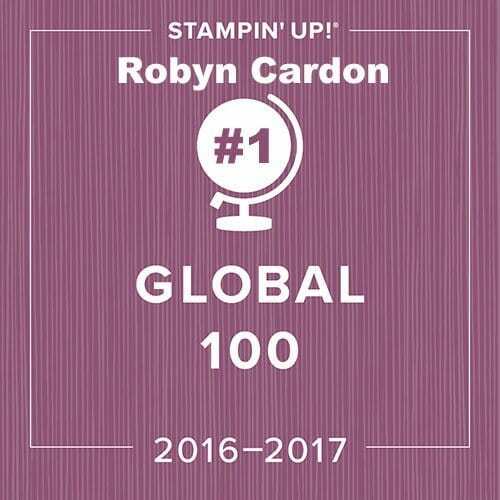 Congratulations, Robyn, again! Enjoy your day!